BOSTON, May 8, 2014 – Single-family home sales in the Nutmeg State rose 3.2 percent in March compared with March 2013, according to a new report from The Warren Group, publisher of The Commercial Record. 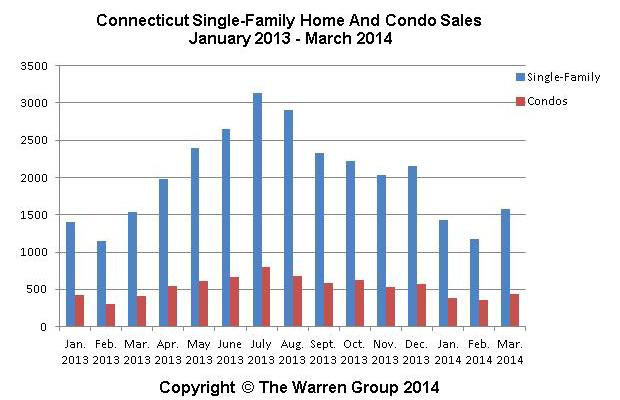 This is the eleventh consecutive month of home sale increases in Connecticut. There were 1,583 single-family homes sold in the month of March, a slight gain from the 1,534 homes sold in March 2013. Sales of single-family homes were up by 2.9 percent so far this year. Statewide, a total of 4,198 transactions were completed in the first quarter of the year compared with 4,081 in the first quarter of last year. The median price of single-family homes fell by 8.2 percent in March, selling at $225,000 compared with $245,000 in the same month last year. Prices of single-family homes were also down by 2.1 percent in the first quarter with a median selling price of $230,000 compared with $234,900 last year. Condominium sales remained strong in March with an 8.1 percent increase over the same month last year. There were 442 recorded sales, up from 409 in March 2013. Condo sales were up by 4.9 percent in the first quarter of the year compared with the first quarter last year. The median price for a condo fell in March by 3.5 percent to $154,500 compared with $160,000 in March 2013. Overall, the median price of a condo was down slightly by 0.9 percent in the first three months of the year compared with the first quarter of last year.